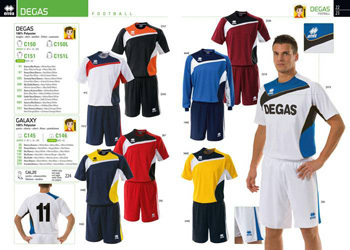 If you are looking for football gear for your team or club Soccer-Ireland.Com is delighted to recommend DOR Teamwear. Based in Crookstown, Cork, Ireland, DOR Teamwear supplies Errea sportswear, the world's most technological advanced soccer strips to clubs throughout, Cork, Munster and Ireland. 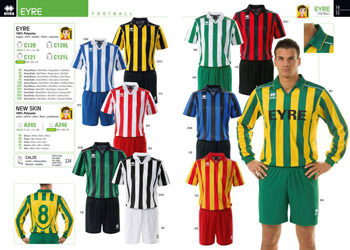 Errea Sports is a world leader in specialised sportswear for soccer, GAA, rugby, basketball and volleyball. Using advanced technology Errea create some of the finest, yet affordable, sportswear anywhere in the World. Errea is the technical sponsor of Italian football clubs Parma and Atalanta. For an additional 20% you can design your own soccer kit. There is a lead time of approximately 40 days. DOR Teamwear supplies Errea soccer gear to Irish football clubs because it is the only European manufacturer of OEKO TEK Standard 100 certified sportswear. This guarantees that all Errea sports products do not release any harmful toxins or substances when in use thus protecting the health of children and adults wearing Errea gear.